Contact Jessica at Berry House on 01823 665500 or complete the enquiry form. Looking to rent an impressive country house close to Exmoor National Park in Devon? If so, Berry House could be ideal for you. With 8 bedrooms this is a fantastic large holiday house to hire for a special occasion, family holiday or celebration. With ample space for up to 16 friends or family, this spacious property is a fantastic place to stay whatever the occasion. Sitting elegantly by a beautifully manicured lawn this property impresses both inside and out. With large spacious rooms and a stylish light bright and airy feel, this is a great place to relax and enjoy good times with friends and/or family. There are ample sociable living spaces ideal for the larger group including the impressive formally styled dining room with its sash windows and valley views and a drawing room/snug with comfy sofas, large flatscreen TV and full Sky Movies and Sports package and a further sitting room/drawing room which features more comfy sofas and a marble fireplace. The kitchen as you would expect is spacious, high quality and very well equipped with a 4 oven Aga, electric hob and oven, fridge-freezer, two dishwashers and microwave. There is also a separate room with washer/dryer and additional freezer as well as a separate pantry. In terms of the 8 comfortable bedrooms, six feature en-suite facilities and there is one shared bathroom. For fun times with friends or family there is a games room where you can enjoy a game of pool or table football together. Another fantastic feature of this very special property is the indoor swimming pool where you can all enjoy making a splash. With Exmoor National Park within easy reach, there are great opportunities to enjoy walking, cycling and sightseeing close by. For days by the seaside, the coast is less than an hour’s drive away and for those who enjoy the outdoor life there are opportunities to enjoy fishing, sailing and other watersports at nearby Wimbleball Lake. With so much on offer though at this holiday home, you may not want to leave at all! 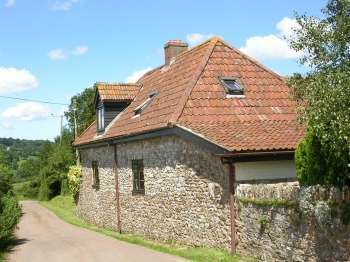 Book this cottage in Devon direct with the owner or agency. For help with any questions or queries prior to booking we recommend you call the owner or email them. Easter short break getaway at Station House - 3 nights arriving Easter Monday 22nd April from £246, (or 4 nights from £280) - Includes WiFi views over nature reserve and Cambrian Mountains beyond Up to 2 dogs welcome with walks out from the front door.